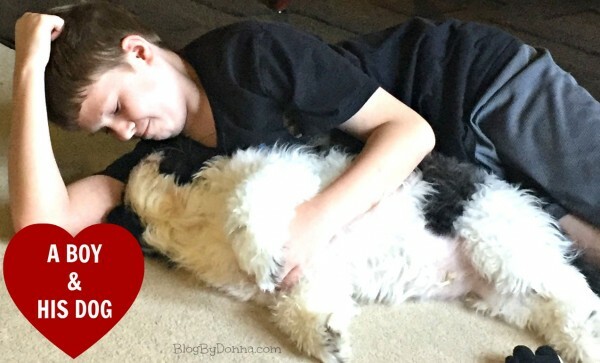 This blog post is part of a paid Megan Media and Petco Repeat Delivery blogging program. All opinions are 100% my own and may differ from yours. I will only endorse companies, products and services that I believe, based on my own experiences, are worthy of endorsement. Saying I’m a busy mom sounds almost cliche anymore, but as any woman who is a mom can attest to… we are busy. All. The. Time. If along with your human kids you also have a fur baby (or two or three) you also know it’s like having another child. 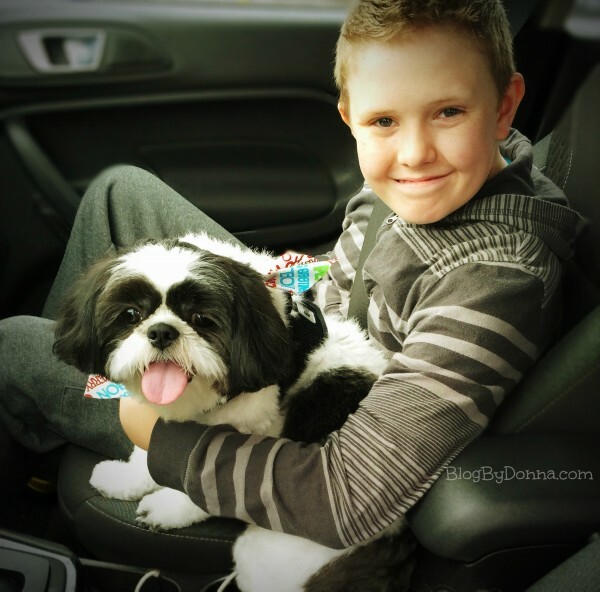 I know our Baxter is a huge part of our family. My son even referred to him as the brother he never had, just with fur, when we first brought him home over 2 years ago. I love my family, dog included, very much. That doesn’t mean I don’t feel exhausted more often than not, taking care of my family. I’m thankful to Petco for giving me one less errand to run. One less thing to worry about. To be more specific, it’s the Petco Repeat Delivery service that is making my life easier. Now I don’t have to drive out to Petco (or any other pet store) for Baxter’s dog food or pet care needs. I can order whatever we need for Baxter and it will be delivered to our door. 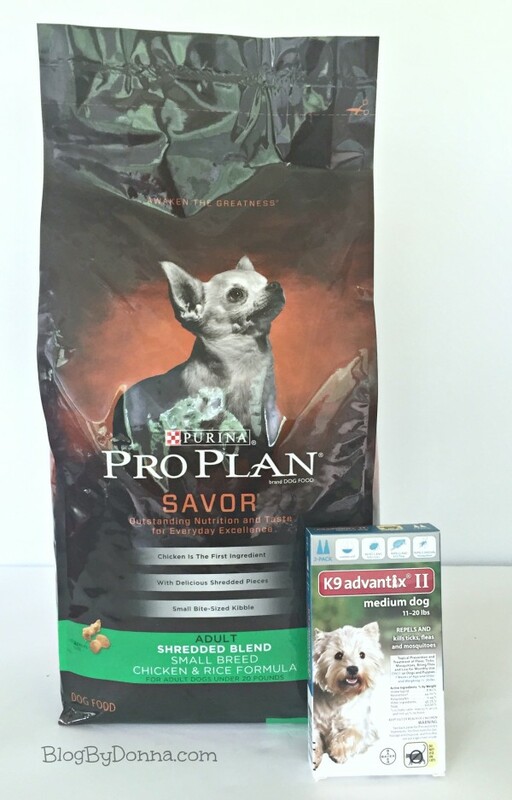 We love to feed Baxter Purina Pro Plan Savor for small breed dog food and well, he loves it too, so I think the Repeat Delivery program will work out wonderfully for us to be able to have his dog food delivered to our door on a regular basis. No more having to run out to the pet store. I ordered him a 2-month supply of K-9 Advantix Flea and Tick treatment. I’m really going to appreciate the Repeat Delivery program for this because it’s not easy to remember to get it ahead of time and then when the month is up, I have to run out to pick it up or I’m a day or two late in treating him. Now I’ll have the flea and tick treatment coming every 3 months now like clockwork. After you’ve decided what you want to purchase you will select Repeat Delivery. 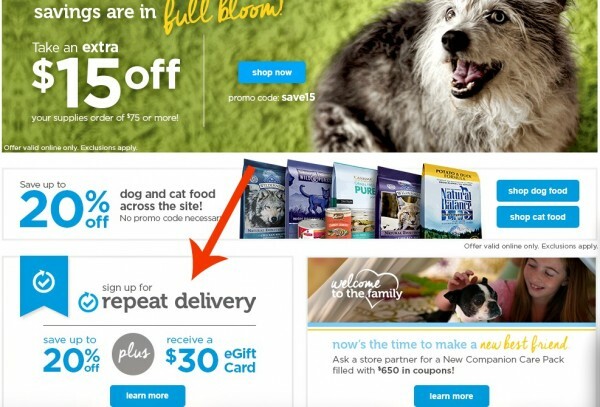 This way Petco will know that you want your products delivered on a regular basis and not just a one time delivery. I selected to have Baxter’s dog food delivered every three weeks, since a 6 lb. bag lasts just over that and the flea and tick treatment to be delivered every 3 months. 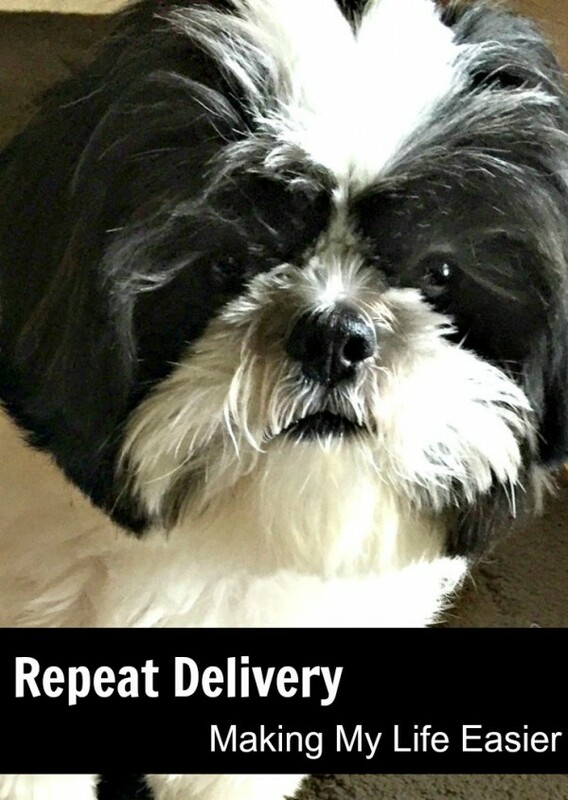 If you sign up for repeat delivery you will receive up to 20% off certain items for your pet and you will also receive a $30 eGift Card with any purchase you make over $39. How awesome is that? First-time new customers must sign-up and place their first Repeat Delivery order, between Friday, April 1, 2016 and Saturday, April 30, 2016. So hurry and don’t miss out on this amazing deal! The value of the Promotional eGift Card is applied to the total purchase, including shipping and tax. Exclusions: The Promotional eGift Cards are not valid on donations, backordered items, or the purchase of another Petco eGift Card or physical Petco Gift Card. Do you have a pet? What products would you like to have delivered via Repeat Delivery to your front door? I almost forgot… there’s a giveaway! Giveaway is open to US 18+ and will end on May 16, 2016. One person will be selected across several blogs, to win a $100 Amazon Gift Card. Sponsor is responsible for prize fulfillment. Enter on the Rafflecopter form below. Good luck! This repeat delivery sounds like a real time and money saver. Thanks for the information. I have forwarded it to my friends with pets. Sounds like a great program. I love taking kids into store too! What a sweet pet you have! And this sounds like a fantastic service. How convenient, love this idea! Will have to check out Petco, never shopped at Petco before. Looks like I may have to make this my first try! Oh wow, I may have to consider this for cat food. I would probably save a lot. 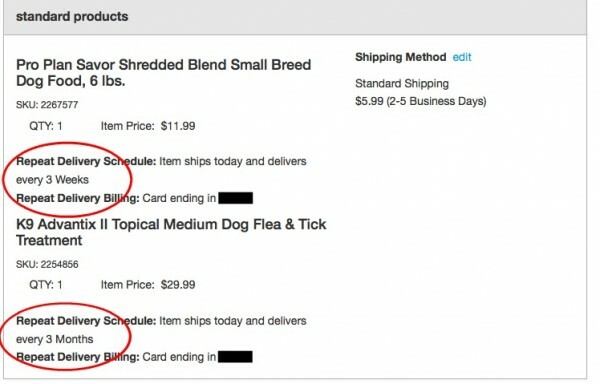 We use the repeat delivery feature from Petco as well, and it really does make life more simple. And, I find we save money buying this way too! Interesting program, but I don’t have pets. It is so important to keep the same food for your animals. Repeat delivery is a great way to save yourself time and keep a constant diet. Wish I had a pet! Great info and I bet this is gonna be a great giveaway for petowners! Wow what a fantastic service! Our dog has some repeat products and we often run out before someone realizes we have not ordered a back up. I’m going to have to check out Repeat Delivery. We don’t live near a Petco, but they offer my rottweilers food a lot cheaper than my local pet specialty store. Isn’t this great it does make life easier. What an awesome program! I had no idea that Petco did this, this is beyond helpful! 🙂 Thank you for sharing! !